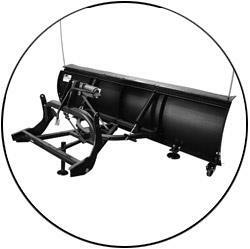 Each snow plow ships in a single carton complete with hardened steel cutting edge scraper, rubber snow deflector, polymer-wrapped wire rope plow markers, skid shoes, castor kit for easy storage, and a 3,000 lb wireless electric winch. 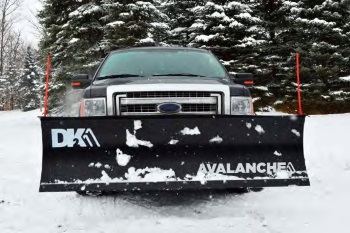 Each Avalanche plow will also include a set of adjustable blade stiffeners for added strength by creating a 3 point connection. K2 Snowplow slides in and out of the front 2" receiver. Plow comes with a unique angle directing design. This allows you to angle snow in 3 different directions. You can direct on either side at a 45 degree angle or straight ahead. Its all in your hands. 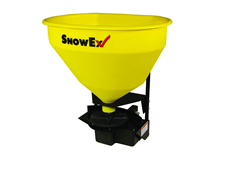 With locking caster wheels plow can be moved and stored in seconds. Just drop the wheels and slide wherever you want to store. Assembled Weight of 265 lbs. 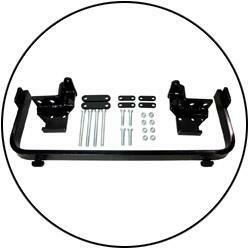 Requires a K2 Custom Front Mount System - Click Here To View the K2 Mount Guide - They Cost $399.00. K2 Snowplow slides in and out of the custom mount system. 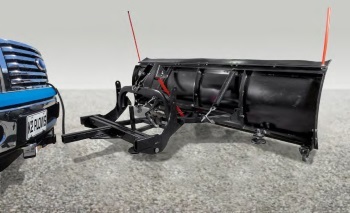 The Plow Hooks Directly Into The Custom Mount System. 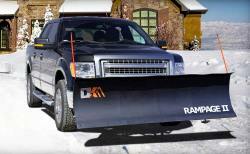 Just use the locking mechanism and you can bring the plow wherever you go.